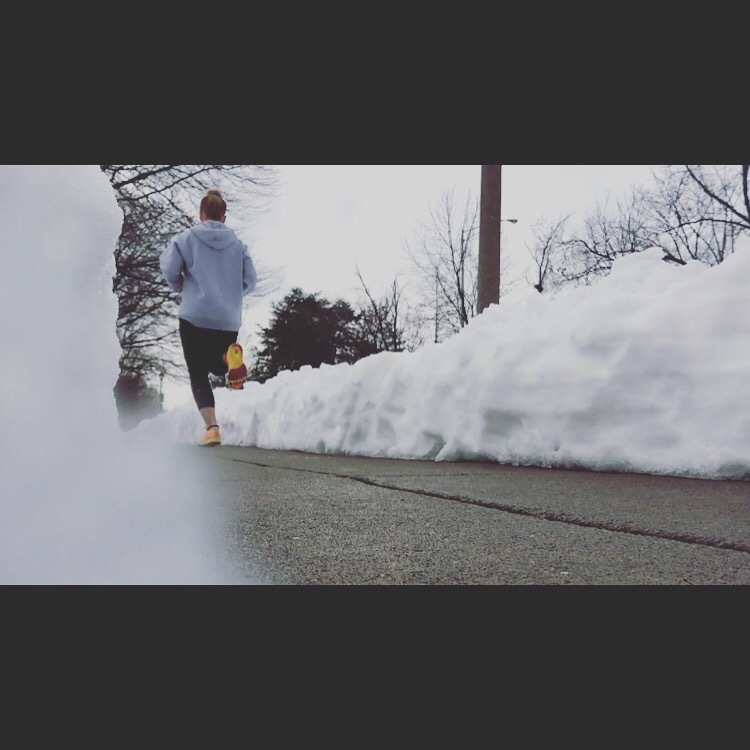 Blizzard Running – How to run in the cold. Last Friday, the East Coast got slammed with a record breaking blizzard. We got 2-3 feet of snow depending on location. So of course all of us runners were trying to squeeze in one last run before the storm started. And then we were all desperate to get running right after the streets got plowed. Although, it was a little tricky to find a place to run, right after the storm, I did, and it was awesome. I started out slow, but finally got into the 8s. At 5 months postpartum I am finding every new day I am feeling closer and closer to the fitness level I was before pregnancy. Anyway, I love winter running. Running while it snows, or surrounded by snow can be very peaceful. During, the winter, the trails are less busy – maybe there are less runners training for spring races, or maybe more people are jumping on the treadmill instead of the pavement. Another great thing about winter running, is that the winter air can feel extremely refreshing, and that coffee post run, even more rewarding -warming you up instantly. With that being said, still so many runners are still confused on how to have a comfortable successful winter run. So here are my top tips for winter running. 1) Always dress warm enough. Normally, the trick is to dress as if it is 10 degrees warmer out. For example, if it is 40 degrees out, dress as if it is 50 degrees out. Your body will warm up once you start running. However, the bold words above say, always dress warm enough and what I mean by that is with accessories. A hat is key. You loose a lot of heat through your head so keep it covered. Also consider wearing a scarf and gloves. The best part of staying warm with accessories is that when you are to warm you can take them off. Also wear the appropriate running clothing. Instead of wearing a sweatshirt actually consider wearing a technical running jacket made specifically for winter running. This goes the same for socks, try smart wool – which will keep your feet dry and warm. Never wear cotton, always wear a sweat wicking material that will absorb moisture and keep you dry. For more information on this check out my blog post on why it is important to invest I. proper technical running gear. One of the hardest parts of winter running is that the days are shorter. Meaning there is less time during the day, less sunlight. Some early morning runs are done before the sun rises and others are done at night, after the sun sets. A lot of runners are running in the dark. So always wear bright colors, reflecting gear, and/or a light. There has been so many cases when runners have lost their lives from being hit by a car. It is super important to always be seen. Although, you may not feel thirsty the intense way you feel while running during the summer months, you still need to drink the same amount of fluids. This seems like common sence, however time and time again runners end up dehydrated during the winter months. The air is much more dry and wind can also play a role in dehydration. So drink up. If possible choose a running route where you begin running into the wind. That way you have a more difficult time when your legs are still fresh. Then as you head home you run with the wind. That way the last half of your run is faster and easier. 5) Always warm up your muscles. Start out slower and warm up your muscles. Because of the cold, you are actually, more likely to get injured. Once you are warmed up, pick up the pace. If you need to stretch, stretch after you run. This gives your body the opportunity to warm up all the muscles, so when you stretch you can stretch deeper. So those are my tips for winter running. Now get off the treadmill and let’s run outside!